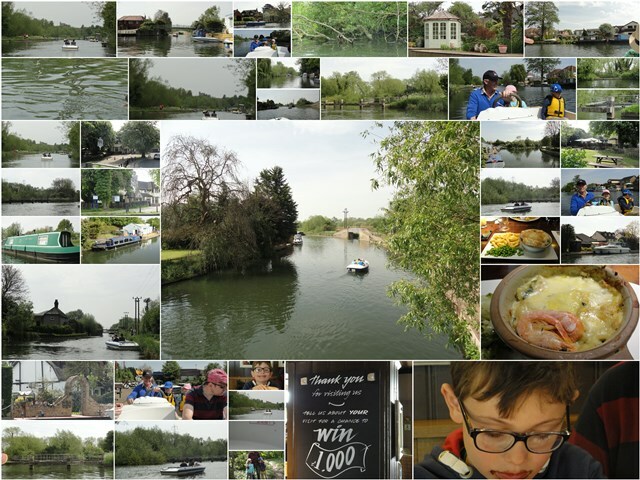 After a shower and breakfast we drove to Broxbourne Riverside for a boat cruise. While we waited for a boat to become available we took a walk on the banks of the canal. We had a one hour cruise and Dave taught Maya and Josh how to steer a boat. We then had lunch at The Crown which is part of the Vintage Inns group. Dave, Tali and I each had one pie off the Vintage Pies menu, which are specially created by James Martin. Sadly the kitchen service was appalling and we waited an hour for our meal – not good with 2 kids! I had the fish pie which was meant to be Scottish salmon, smoked haddock and king prawns but which was more potato than fish! It was very tasty though, as were Talya’s British beef and merlot pie and Dave’s chicken, ham and leek pie. After lunch we did a bit of shopping and then came back to Talya and Jon. We finished packing, got the tube to the airport and spent some time walking around duty free. This included buying a bottle of Laphroaig and a Glencairn Glass. We snacked on some sushi and then made our way to the gate. We got there just as boarding started! The flight back home was uneventful – another amazing holiday! Slept in a bit and after a cup of coffee and a shower I went with Talya to take the kids to Cheida. We then came back to the house and I had breakfast and we did a load of laundry as Dave needed a t shirt for the flight home. After that we went to fetch the kids, and then went to Ye Olde Cherry Tree for lunch. I had a spinach, ricotto and tomato tart with baby potatoes which I smothered in horseradish sauce. For dessert I had the raspberry creme brulee. We came back to the house and relaxed for the afternoon, baked a banana loaf and I helped Talya spring clean the kitchen. Jon braaid some chicken pieces that Talya had marinaded in an amazing bbq sauce all day. I turned the left over roast potatoes into a salad and we had a green salad to go with that as well as some corn on the cob. We finished the rhubarb crumble, ate some banana loaf and had stilton on crackers. Dave checked in for our flight and not long after that we went to sleep. Woke up very early and got up just after 7 to make coffee. After a shower and breakfast I went with Talya to watch Maya and Joshua have their swimming lessons. We collected Dave and Jon for our long walk around London. We caught the tube to Knightsbridge and our first stop was Harrods food hall. We then went to Harvey Nichols and we got a few items from there. We bought lunch from Pret and had a picnic in Green Park. All of their food is made fresh each day and what is not sold is offered to charity! Dave and I sbared 2 sandwiches and both were very good. We then went to Fortnum and Mason where I bought one item and spoke to the person in charge of the wines about their South African selection. 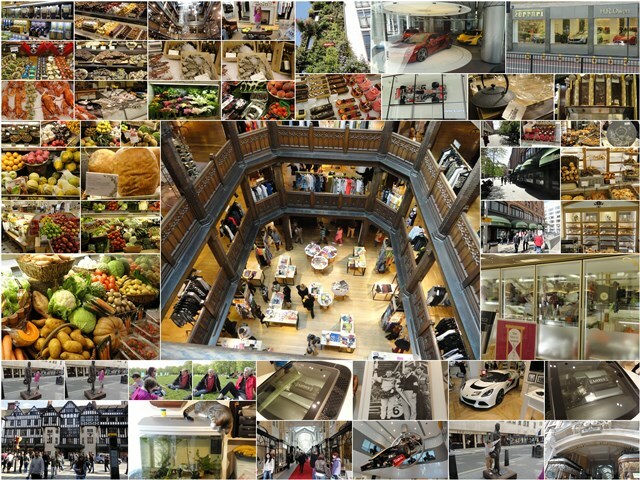 After that we walked through Burlington Arcade and on to the Lotus store. We then went to Hamley’s which was a mad house and from there to Liberty. The building is amazing with wood carved bannisters and railings. By then the kids had walked enough (at least 5 hours) and so we got the underground back to Arnos Grove. Dave, Tali and I went shopping and Dave cooked pasta with a chicken and vegetable sauce. That was followed by a rhubarb crumble that was in the oven a bit too long. We had some Stilton and after all that fresh air went to bed quite sleepy! Dave and I had an early start to the day with breakfast at The Tilted Wig and then a very interesting business meeting in Coventry. After that we drove through Stratford Upon Avon, Banbury before stopping in Buckingham which is an historic market town. We walked around a bit, saw the River Ouze and went for lunch at the pub at the White Hart Hotel. I had a half pint of Strongbow citrus edge which I really like and Dave had half a pint of Timothy Taylor ale. I had the roasted cauliflower tart for lunch and Dave had the beef and ale pie (two main courses for £12). After that we drove back to Heathrow and dropped the car off at then got on the underground to head for Talya and Jon. A couple got on at Terminal 1 (one stop after us) and the smell of fish was unbelievable. I covered my nose with my scarf it was that bad. Some people moved even. She got off half way into our journey. Eventually we arrived at Arnos Grove and Talya collected us. We sorted out suitcases and relaxed and had an amazing family dinner. We left Little Haven just after 8am and drove up the northwards up the west coast towards Aberystwyth (aber meaning river mouth). We stopped at Aberaeron for coffee and met a lovely couple who had visited SA and regaled us with wonderful stories. They had the cutest Scottish terriers – one who sat on the window ledge. We turned inland at Aberystwyth and drove over Devil’s Bridge (Pontarfybach) but did not see the waterfalls. 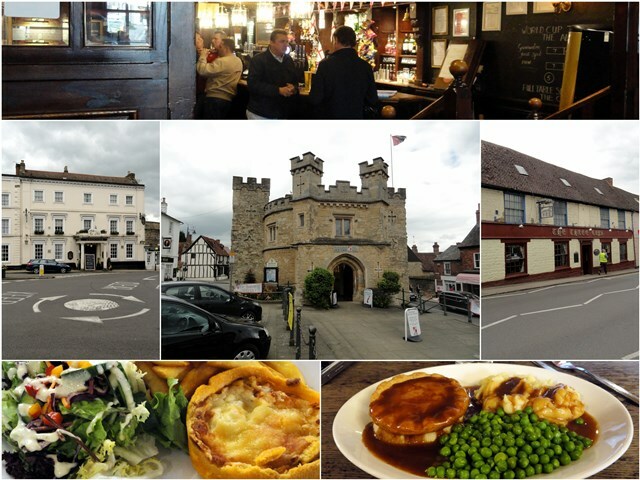 We then drove through Newtown – a new town since 1279! (y Drenewydd). We passed a sign that said ‘salt seller’ for a place that sells salt! Too quaint. 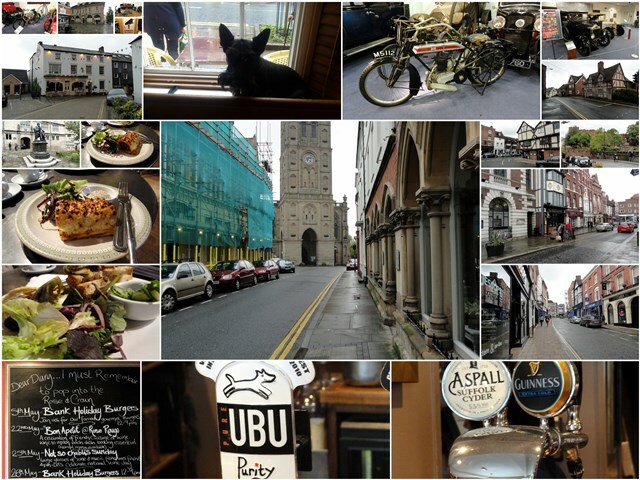 At 12:12 we crossed the ‘border’ to England and stopped in Shrewsbury – the birth place of Charles Darwin – for lunch. 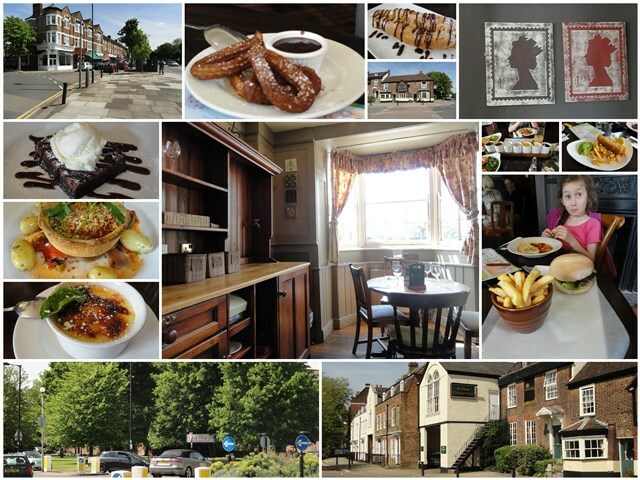 We ate The Shrewsbury Coffee House, which has th best wifi (topsecret) password! I had a pear, walnut and Shropshire blue cheese sandwich on rye which was delicious and served with a side salad and lightly pickled cucumbers (£5) and Dave had Cooper’s sausage roll served with a side salad and chutney (£4) which was very spicy. Leaving Shrewsbury we crossed the English Bridge and drove past a Nando’s and went over the River Severn. We then entered Warwickshire – Shakespeare’s County. Dave had a business meeting in Coventry so we went to that first. The gentleman we were meant to see was not available so we were taken around by the person who deals with the sales to Dave’s supplier. After that we walked around the Motor Museum which shows some of the city’s devastation during the blitz. We then drove to Warwick and found the Tilted Wig quite easily as this is where the Garmin decided the city centre is. After parking the car and checking in we took a short walk around Market Square and then headed back to the room to check emails etc. Thankfully we did this as Dave’s meeting for tomorrow is an hour earlier than what we confirmed twice yesterday! We had dinner at the Tilted Wig as part of our stay and I will blog about that on Lavender and Lime :). Dinner was good and the bed comfortable. Dave’s signature breakfast started the day before we headed to Carew Castle which is 2000 years old. We did not walk around the castle as at £4.75 each it seems not worth it. There was a mill on the site from 1540 and on the outer edge of the castle ground there is a Celtic cross from the 11th Century. We drove past the Priory Inn which has its own ancient piece of wall before crossing a 75p toll bridge heading towards Pembroke Dock (Doc Penfro). We stopped at Saundersfoot for an espresso and a walk around. Espresso at £4 for the two of us is more expensive than our evening drinks at £3.20 (about). We drove on to Tenby (Dinbych y pysgod) and walked through the 5 arches gate of the castle to the market where all we bought was a leek! We finally found a fresh fish shop while walking towards the harbour. Simply Seafoods is situated at the Old Harbour Masters Office and for £1.37 we got a generous handful of mussels and another generous handful of clams. Both are in the shell. We walked towards the Tenby museum which is the oldest in Wales and up to an Iron Age fort – the Little Fort of Fishes as Tenby is translated in Welsh. This Iron Fort region become a Norman Castle and on a clear day you can see Devon across the Bristol Channel. We had ice cream at Fecci’s Ice Cream Parlour which has been in existence since 1919! Dave had toffee fudge and I had liquorice and blackcurrant which was delicious. 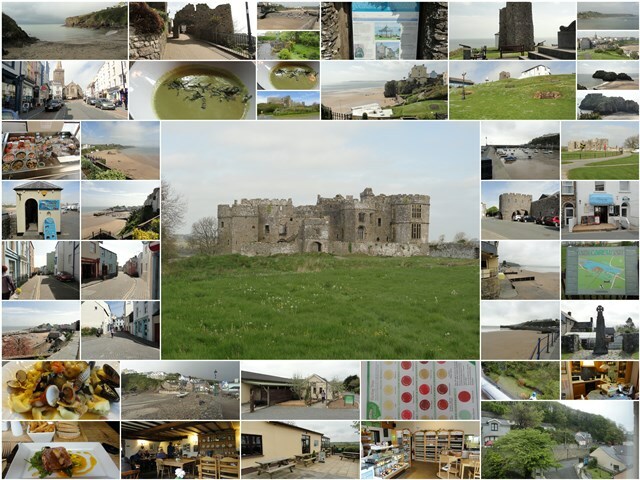 We walked around Tenby for an hour and 15 minutes and then drove past Manorbier (Maenorbyr) Castle, through Freshwater East to Stackpole (Ystangbwll). We had lunch at The Stack Pole Inn. Half pint of cider for me and a half pint of double dragon (Felinfoel) for Dave. They use local suppliers which is great! Find them at SA71 5DF. I had asparagus, pea and mint soup (£5) and Dave had country pork terrine with homemade piccalilli (£6.50) and chips (£2.50). We drove through the Castlemartin (Castellmartin) Firing Range where we were warned about sudden gun fire and could have spectatored had we wanted to! The range is open 30 days a year for walks. We them drove through Pembroke (Penfro), past the castle twice (which has glass in some of the windows) on our way to Cresselly and Crosshands. We stopped in at Gwinllan Vineyard (Cwm Deri) in Martlewy. We did 6 tastings (tiny shot glasses) for £2 and bought Scrumpy as well as some gifts. We drove through Slebach towards Haverfordwest where we stopped at Vincent Davies. Im’m looking for a baneton which I didn’t find. But I did buy some muslin. We put in £20 more diesel and came back to Little Haven. After dropping off the shopping we went to Saint Bride’s Inn for a drink. Back at the apartment we started with the cider. We finished the Hardy’s with dinner which was the rest of the spinach and ricotta tortellini with a mussel, clam and vegetable sauce. I had the last of my chocolate for dessert and Dave and I shared an entire punnet of strawberries which were topped with cream. In continuing the theme of finishing off everything, we had the rest of the cheese and crackers! Breakfast today was scrambled eggs made with cream and bacon. We started our adventure by driving to Whitesands and doing the 3km St. David’s walk. This took us over cliff paths and heaths covered in bracken. After an hour and 20 minutes we had completed our walk which included walking around Warrior’s Dyke (Clawdd y Milwyr) and Iron Age Fort from between 750BC and 1000AD. We also paused at Coetan Arthur – a Neolithic Cromlech (burial chamber) which dates to 4000-3000BC. We drove into St. David’s (Tyddewi) and had an espresso and Dave bought himself some salted caramel and almond fudge. We took a look at the Cathedral and then went to Pete’s Fresh Veg shop and bought leeks and a bread mix. In our effort to find fresh fish / crab we drove to Solva Farm up Panteg Road and even though we found the farm, there was nothing going on. We also found Will the Fish at the bottom of the road – house name Parcbenny – but that too was a waste of time. Driving through Roch we saw a sign for crab and bought some dressed crab (£5.25) from Maureen Thomas (6 Grossholm Close). We then drove some stunning back roads on our way to Treffgarne. We had lunch at Nant y Coy Mill alongside the Treffgarne Gorge (postal code SA63 5LR). The mill was built in 1326 and there is a nature trail you can do to see otters and bird life. The waterwheel is not working but they used to grind corn at the mill. Dave and I had a Gwynt y Ddraig (Black Dragon) Perry Vale Cider to share and for lunch I had Welsh rarebit (£7.00) and Dave had Caerfal Caerphilly Ploughman’s with homemade bread and chutney (£7.50). After lunch we drove to Haverfordwest and put in £20 of diesel. Here you put in fuel and then pay! Different to Italy where with self service you pay first. We did some more shopping and popped in to Thorntons for toffees and a Turkish Delight sugar free chocolate for me. 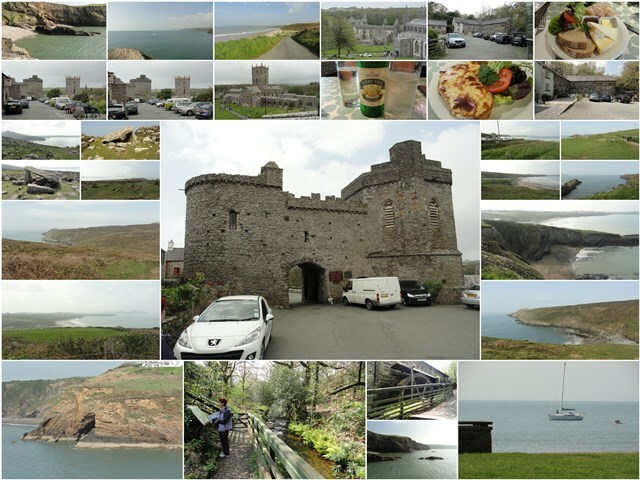 We headed back to Little Haven and went to The Castle for cream tea. Dave and I shared the raisin scone which was nice but nearly as good as a Devonshire cream tea. My tea was cold – totally gross to take a sip of cold tea with milk! After that we walked to the point and stopped in at The Swan Inn for half a pint of cider and bitter. For starters we had the dressed crab, lightly seasoned and with some Helmann’s mustard mayo on crackers. Dave cooked spinach and ricotta tortellini (pre made) with a leek, tomato, bacon and courgette sauce. We shared a bottle of Prosecco DOC Brut and I had chocolate for dessert and Dave had some of his toffee. We chose a Welsh white brie at Tesco’s and we had that with crackers. The cheese here is fantastic!